Please click on the picture to view larger USDA-ARS images. "USDA ARS scientists Dr. John Harbo and Dr. Jeffrey Harris at the Honey Bee Breeding Laboratory in Baton Rouge, Louisiana, have defined and tested a trait of the honeybee which appeared to suppress mite reproduction (SMR). 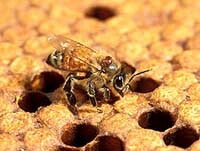 Recently it has been better defined as "varroa sensitive hygiene (VSH)." This is a form of behavior where adult bees remove pupae that have reproductive mites but do not disturb pupae that have mites that produce no progeny. Dr. Harbo and Dr. Harris proved the effectiveness of the SMR/VSH trait by exchanging queens between resistant and susceptible colonies. Each time a resistant queen was put into a susceptible colony, the mite population went down. On the other hand, every time a susceptible queen was placed in the resistant colonies, the mite population increased. 1. 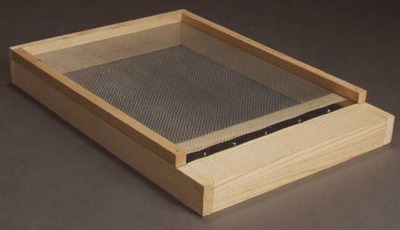 The USDA helped Pierco out with the mold for this new hard plastic, beeswax coated frame for use as an Integrated Pest Management technique for combating the Varroa Mites. The frame is colored so you will be able to see which frame it is in the hive. You should have two for each hive so you can rotate. Bees draw beautiful drone cell foundation with it. It is so much easier to use than the straight unwired drone foundation. 81/2 x 161/2 Medium Brood Drone Comb Foundation 10 Sheets Per Package Ship Wt. 2 lbs. Per Package. Did you know Varroa mites are attracted to developing drone brood much more than they are attracted to worker brood? 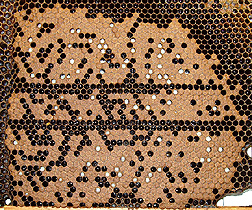 By using a few frames of drone comb you can lure Varroa mites to the developing drone brood, and the mites become trapped within the drone cell when the bees cap the cells. Remove the frame of capped drone cells. Put it in a plastic bag in your freezer overnight to kill the mites. Remove from the freezer and let warm. With the cappings scratcher on page 45 break open the drone cells. Then, put the frame back into the colony and allow the worker bees to clean out the cells, getting rid of the dead varroa mites and drones. After the queen lays drone eggs in these cells again, this Varroa trapping cycle is repeated. Therefore the above cycle may be repeated to capture and kill more mites. By utilizing this process a large percentage of Varroa mites are naturally eliminated without chemicals. This product was added to Dadant catalog on Monday 20 May, 2002. According to Betterbee, "For those interested in raising their own queens that manifest hygienic behavior, the drone comb can be used to check for such behavior. 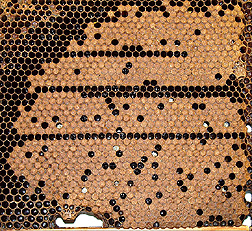 Cut a patch of brood about 3" x 3" in a rhombus shape out of the frame of capped drone brood. Place the piece of comb in the freezer for 24 hours - then replace the comb. By comparing how quickly and thoroughly each colony removes the dead bees and cleans up the comb, you can select the queen from which to breed. Hopefully, this hygienic behavior will translate into more mite and disease resistance in your bees." 4. Buy ARS Russian or SMR/VSH Bees.